Yay, it's Wednesday! Well, here in the US it's almost Wednesday! But either way, it's time for What's On Your Workdesk Wednesday. It's our weekly trip/snoop to desks all across the world to see what everyone is working on. I haven't been able to participate for over a month since I got so caught up in all the last minute preparations for our daughter's wedding...which. by the way, turned out SPECTACULAR!! So here's my incredibly messy desk for today. I'm working on taking apart some really old wallpaper books. 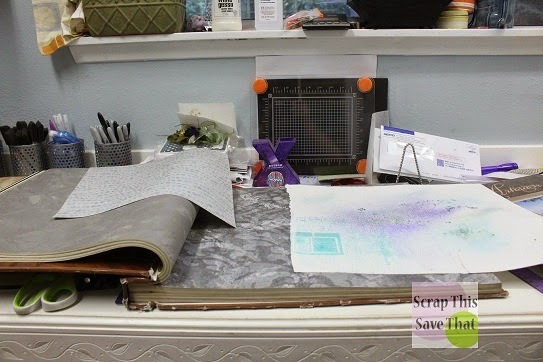 I have found that some of the most awesome scrapbook and card making paper there is, comes from old wallpaper books! Yes, I know it's not all acid-free, so I'm always careful to use copies of photos....nothing old and original. So there's the mess! And if you like hunting for it, the WOYWW button/badge is hiding in plain sight as usual! I took it easy on you this week! Also, for those of you I haven't seen lately, I wanted to share the wedding gifts I made for my daughter and new son-in-law. I cut vinyl on my Silhouette and mounted it to ceramic tiles and then gave it to them with easels so they could put the two art pieces on their fireplace mantel. 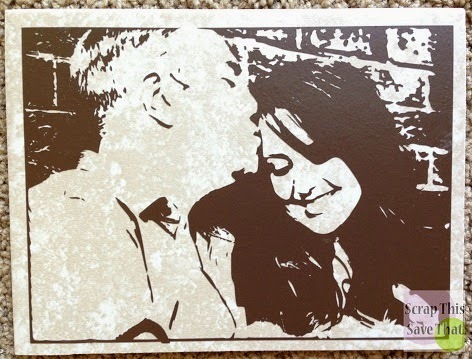 The first one was traced from one of their engagement photos...I absolutely LOVE how it came out! and so did they! 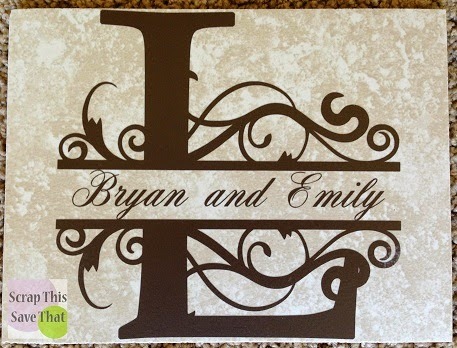 The second is a monogram I bought from the Silhouette Store and then just added their first names. 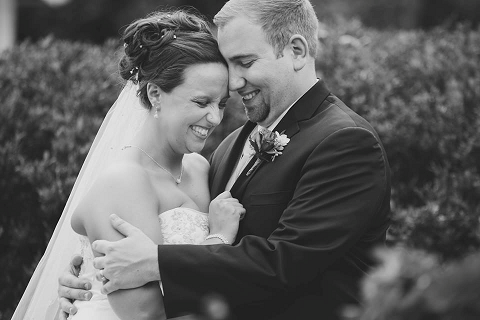 And just because I can't help it, I had to share a couple of photos from the wedding! 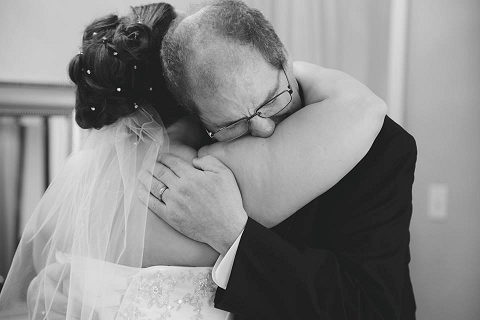 The first is the moment Daddy saw his little girl all dressed and ready to walk down the aisle. He started sobbing...and then of course, we all did! Even the photographer got a little misty! The next photo is of the happy couple right after the ceremony. They waited until after the wedding to take their photos, so they actually didn't see each other until she was walking toward him down the aisle. It was awesome! Thanks for indulging me!!! Happy WOYWW! ah Yes Amy so remember when was at high school using the wallpaper books to cover our books. but no idea where they went now!! out to the tip I suppose my dad was like that!! Love those tiles! And the photo of daddy and his little girl is very special. You've got me crying too! Those black and white photos are wonderful, so precious. I love the artwork you did for them too, great idea! Beautiful beautiful happy and loving pictures. It's still unusual here for photos prior to the walk down the aisle moment; lots of us ending up waiting very patiently after the ceremony because there are so many photos to be taken! Am fascinated that you scrapbook with copies of photos....I need to walk around this for a while. I feel a blog post coming on! Also - had to add - the Thank You banner and its mulitple uses - awesome! All lovely, nothing better than a good wedding to bring families together. Gosh Amy I'm dripping tears over my keyboard, this is all so beautiful. the tiles you made were so special and the wedding photos, pause to find a tissue,are just so gorgeous. They are clearly very much in love, bless them. Hope her Dad has coping with his little girl leaving home now, he looked so thrilled with how beautiful she looked. It must have been a very blessed time for you all. Thank you for sharing. Oh and I forgot to say how great wallpaper books are. such lovely photos, it was lovely to see the happy couple and a misty eyed Father. I love the gifts you made, they are beautiful. Wonderful photos, and what a fabulous way to share them, that is amazing! A Happy woyww to you! A lovely day, Amy. Great gifts - they have come out beautifully. Well done. Sounds like the wedding day was a huge success all round. Gorgeous photos Amy. I love the gifts you made for the couple's mantel. Your daughter looked so beautiful! Yeap! I cried too!! Such beautiful photos!! She is Gorgeous! !And I love the tiles....very Creative!! Awesome gifts and I loved seeing the photos. Thank you, for sharing them.